Sometimes you don’t have to go far to find beauty and seclusion. A mere hour or so from our house into the Rio Pita Valley, and heading directly for Cotopaxi Volcano, we found Condor Machay waterfall. The path to this 80 metre high waterfall takes you along the rushing river, through a green lush paradise with moss clinging to every tree and rock, tree branches overhanging the trail, waterfalls trickling down rocks and roots claiming ownership over the path. 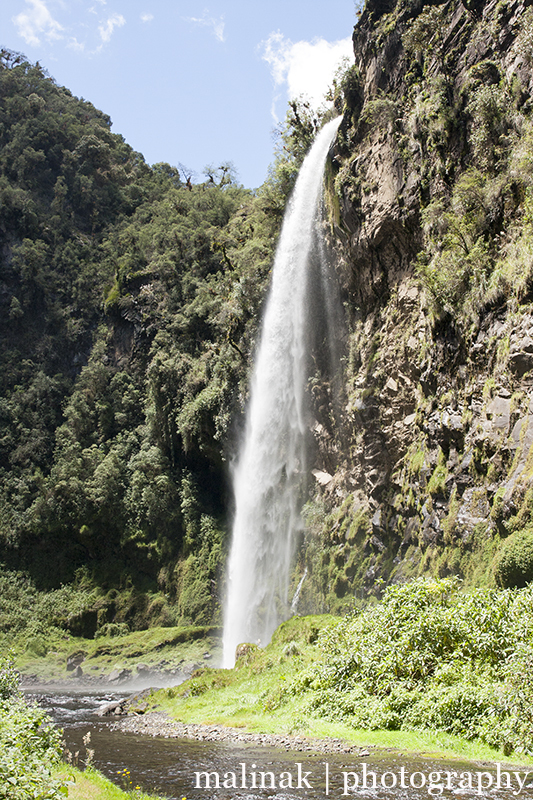 Tucked into a deep sided gorge, you can see why the waterfall was named Condor Machay, which means ‘nest of the condor’ in the area’s indigenous language Quechua. Here you feel as if you are a million miles away from humanity, when really you are mere miles from the outskirts of Quito. It is intoxicating. The path snakes across several bridges, some rather rickety, crossing the river as it cuts its way through the landscape. After a wonderfully leisurely, and yet full, hike, you get a quick glimpse of the surprise at the end, before diving back into the trees. Finally, the path opens into an expansive space full of mist from the water crashing down. The scale is hard to believe without a subject in front. With its ever changing light, the gorge feels like a completely different place. Sitting here watching the water running off the rock face above, it is easy to feel a connection with the landscape and to ponder the monumental forces that nature can affect. It is almost enough to wander off into the wild and just stay out there! Search for ‘Rumipamba Waterfalls Trailhead’on Google Maps (and open if Waze if you want). Be sure to go to this point and not where it is marked Condor Machay as you may end up on the other side of the gorge, or where there is no road/access. Park at the bottom of the hill and pay the parking attendant a few dollars. It’s fairly safe but make sure you don’t leave anything in sight in your vehicle as usual and lock everything up. There are two trails starting at this point – to the right is Condor Machay. To the left is also meant to be beautiful but about 20 minutes in requires a wet and sometimes deep river crossing so be prepared. It takes us an hour or so from Cumbaya to arrive, and about 1h40 minutes to 2 hours to get to the waterfall itself. Enjoy!